Few people today remember how hard it was to buy a 1961 Chevrolet Impala Super Sport Bubble Top back in their first year of production. For that reason, some Chevrolet experts believe there are less than 45 original cars remaining. 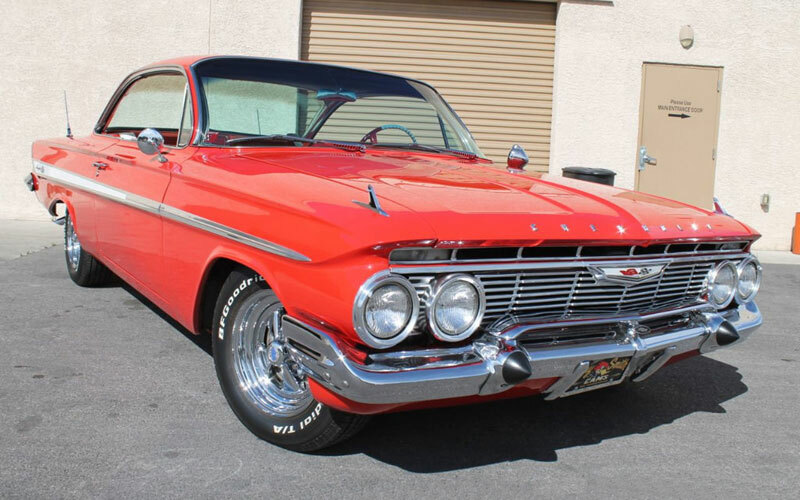 Since 1961 was the first year for the Super Sport, it was the beginning of a long legacy of Chevrolet Impala Super Sport muscle cars. But Chevrolet did not make it easy to order the SS package that first year. You had to check off a lot of boxes to get the SS logo. 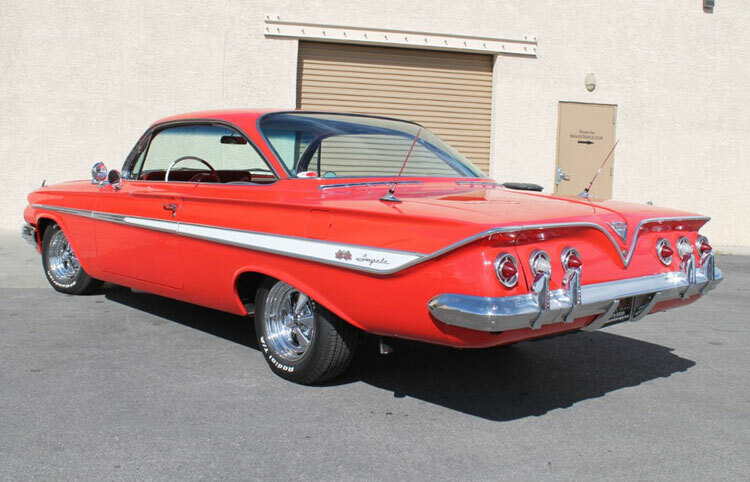 This week, a rare 1961 Chevrolet Impala Super Sport Bubble Top, often referred to as a Sport Coupe or Hardtop, was listed for sale by Classic & Collectible Cars of Las Vegas. What a find this is. (See dozens of detailed photos at this link from Classic & Collectible Cars of Las Vegas online.) It is clad in Roman red paint with a white Impala spear. Of course, it comes with the 348 ci V8 engine with Tripower carburetion and a 4-speed manual transmission. As prescribed, it has the power steering, power brakes, AM radio with dual antennas, bumper guards, spotlight, dual mirrors and a Moon tachometer. Although it now shows Cragar S/S wheels, they say it comes with the original wheels, spinner hubcaps and fender skirts. 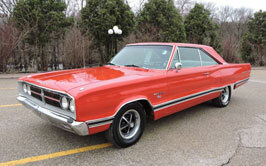 To order the Super Sport package in the spring of 1961 you had to check a long list of options. That may be why only 453 SS Impalas were ever ordered that year. You had to check off the high-performance W-series engine, and a string of other options. At $53.80, the SS Equipment package included upgrades which many buyers may have skipped if they were strictly looking for family transportation. The Impala was not the only Chevrolet on which you could order the SS option, but people who ordered the SS package ordered it almost exclusivey on Impalas. The option included chassis reinforcement, stronger springs and shocks, power brakes, spinner-type wheel covers, and even narrow whitewall tires. Over the glove box you’ll find an “Impala Super Sport” scripted grab-bar, and the 7,000-rpm tach was mounted to the steering column. Condition-wise, Classic & Collectible Cars of Las Vegas says this car is “drop dead gorgeous with pristine paint, chrome and interior.” It is obvious someone has meticulously maintained this vehicle. They say it is laser straight and rust free. You can always tell the actual Super Sport cars by their cowl tag. It would say “SS” next to the ACC code. The cowl tag is found along the cowl wall of the car in back of the engine on the driver side. The 348 Tripower is in itself a famous engine, one of Chevrolet’s W-series block designs, considered a big block engine. Both the 348 ci truck engine and the 409 were W-block engines. It seems that the popularity of the 265 ci V8 for passenger cars starting in 1955 was balanced with some Chevrolet engineers’ concern that they needed a torquier motor for trucks and big passenger cars. So the W-block 348 ci V8 came into being. The 348 was larger and 110 pounds heavier than Chevy’s 265 V8. Power for the 348 ci V8 came from the head design with combustion chambers in the cylinders themselves. The engine created way more low-end torque. The scalloped rocker covers were the giveaway that you were looking at a W-block. The 348 ci V8 was used from 1958 to 1961 in passenger cars and until 1964 in trucks. It was in late 1961 that Chevrolet introduced the legendary 409 which was another W-series big block motor that replaced the 348. The two engines look so similar that the only way to tell them apart is that the oil dipstick on the 348 was on the driver side and on the 409 it was on the passenger side. Otherwise they were pretty much identical from the outside. By the end of 1961 production, Chevrolet was already introducing the other W-series big block motor, their legendary 409 ci V8. So 1961 was the last year that the 348 ci was offered in a passenger car.